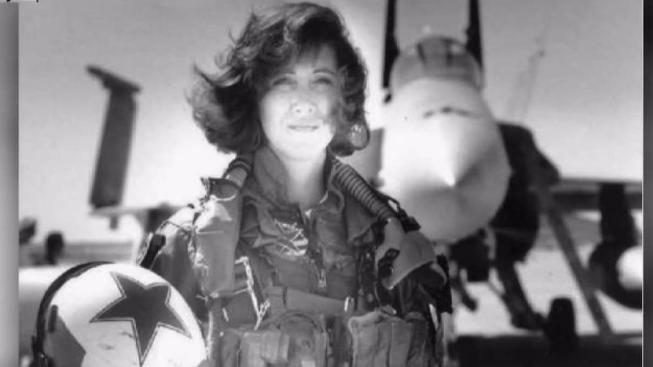 Passengers and airplane experts are calling pilot Tammie Jo Shults, who safely landed a damaged Southwest flight, a hero. Shults and First Officer Darren Ellisor say they were simply doing their jobs. The two pilots in the Southwest Airlines plane that made an emergency landing in Philadelphia after experiencing a deadly mid-air engine failure released a statement through the airline Wednesday. "We all feel we were simply doing our jobs," wrote Southwest Captain Tammie Jo Shults and Southwest Airlines First Officer Darren Ellisor. "Our hearts are heavy. On behalf of the entire Crew, we appreciate the outpouring of support from the public and our coworkers as we all reflect on one family’s profound loss. We joined our Company today in focused work and interviews with investigators." The Boeing 737 was traveling from New York to Dallas Tuesday morning when a blown engine hurled shrapnel at the aircraft, leading to the death of a passenger who was nearly sucked out of a broken window. Passengers described a loud boom, violent shaking, air whooshing through the cabin and snow-like debris floating down the aisle as the incident took place. The plane took 22 minutes to land from the time the engine blew, tilted at an angle higher than normal before the pilot was able to level the wings, and came in at about 190 mph before touching down at Philadelphia International Airport, according to National Transportation Safety Board chairman Robert Sumwalt. "The aircraft began a rapid, uncommanded left roll of about 41 degrees of bank angle," Sumwalt said. "So usually when you're flying on an airliner, you rarely get over about 20, 25 degrees of bank. This went over to 41 degrees." The pilots managed to level the wings and decided to land with a different flap, a device used to increase the lift of an aircraft wing, than normal. "Because they're landing with lesser flaps, that will mean a higher approach speed," Sumwalt said. The flight ultimately touched down at about 165 knots or 190 mph. A 737 typically lands at around 135 knots, according to Sumwalt. "The time from the initial event to touchdown, 22 minutes," Sumwalt said. Sumwalt also confirmed an NTSB meteorologist with Air Traffic Control spotted debris falling from the plane on radar. A piece of engine covering was found Tuesday in Bernville, Pennsylvania, about 70 miles west of Philadelphia. A second piece of debris believed to be from the plane was recovered on state game land just north of Bright School Lane and Route 183 in Penn Township, Berks County, Wednesday morning, Pennsylvania State Police said. Crews could be seen photographing a piece of metal with what appears to be the Southwest logo on it. Troopers waited for the FBI to come collect the item, police said. Sumwalt described the debris as engine cowling, the exterior part of the engine that keeps the wires and pipes from being exposed. The FBI office in Allentown is asking for anyone who believes they have found debris to call 610-433-6488, state police spokesman Trooper David Beohm said. Sumwalt also said photos and videos related to the incident can be emailed to witness@ntsb.gov. During Tuesday's incident, a passenger was partially sucked out of the plane and later died, ending a string of eight years without a deadly accident involving a U.S. airliner. The passenger, identified as New Mexico bank executive Jennifer Riordan, was sitting in Row 14 of the aircraft during the mid-air emergency. That's where investigators removed the side wall area. "Our experts have been documenting the window frame area to understand how the window came out," Sumwalt said. The NTSB also interviewed the flight attendants Wednesday. A group of officials, including NTSB investigators, a Federal Aviation Administration (FAA) representative, a member of the pilot's union, an airline rep and an aircraft manufacturer rep will also listen to the aircraft's cockpit voice recorder to create a transcript. A maintenance group will also meet at Southwest's headquarters in Dallas, Texas to start examining the engine's inspection records. From investigators' initial findings, the accident appears remarkably similar to a failure on another Southwest plane two years ago — an event that led the engine manufacturer and regulators to push for ultrasonic inspections of fan blades on engines like the one that blew apart at 32,500 feet. When investigators from the NTSB examined the broken engine in Philadelphia just hours after it made an emergency landing, they immediately saw that one of the left engine's 24 fan blades was missing. "This fan blade was broken right at the hub, and our preliminary examination of this was there is evidence of metal fatigue where the blade separated," Sumwalt said. The FAA announced Wednesday night it would order inspections on engine fan blades like the one that snapped off and triggered the accident. Metal fatigue is a weakening of metal from repeated use and involves microscopic cracks. It can occur in fan blades, the aluminum skin on most planes or other metal parts. As a precaution, Southwest said it will inspect similar engines in its fleet over the next 30 days. 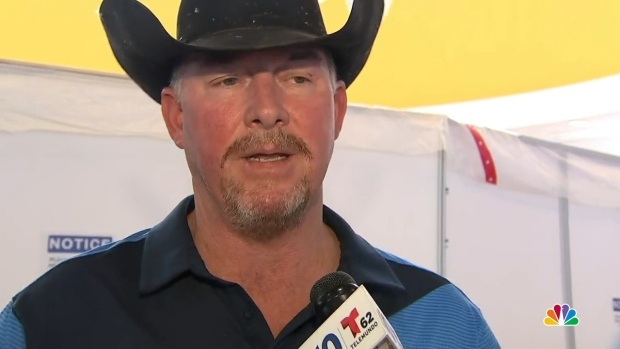 CEO Gary Kelly said there were no problems with the plane or its engine when it was inspected on Sunday. 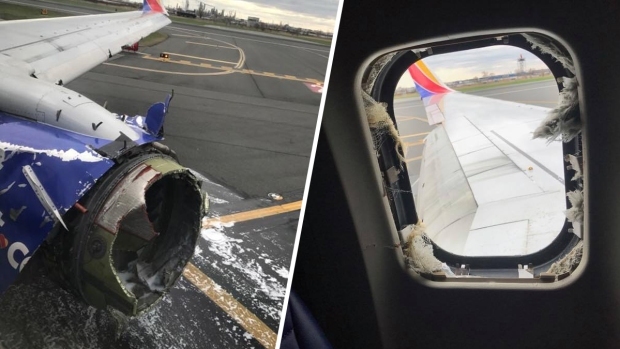 Investigators will focus on whether the fan blade broke off at cruising speed — around 500 mph — and started an "uncontained" engine failure that sent debris flying like shrapnel into the plane, where it broke a window. A registered nurse and emergency medical technician on board jumped in to try to save the gravely injured woman. But Jennifer Riordan, a Wells Fargo bank executive and mother of two from Albuquerque, New Mexico, later died. Seven other victims suffered minor injuries.